The cost of America's freedom is most dearly paid in the lives of those airmen who died defending that right. We owe our liberty to their efforts. 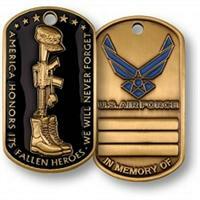 These dog tags remember and commemorate that sacrifice. Minted in a brass alloy, these dog tags are given an antique finish and are imbued with durable enamel accents. The obverse features the a gun propped in the boot of the fallen in the classic military tradition of remembrance. The reverse includes three bands available for engraving. This dog tag comes packaged in a poly-bag with a header card. This coin can be engraved for an addtional charge.